PROPS SET for POSER-DAZ James STANDARD CHARACTER. CHARACTERS NOT INCLUDED. [DAZ is a free Software]. The Perfect Model for Real Ancient Roman Environment Rendering! H-A Set of 17 Hi-Def Hi-Quality Textures with Alternate Versions of the Tunica. Complete materials and Textures [17 textures]. The POSER FILES [Subligaculum and Calcei] have already the BONE STRUCTURE SET COMPLETE and are perfectly conforming with the POSER Character 'JAMES' [Poser 6-7 and up]. Just Load them, Set Conform to... and start using them. The TunicaA and the TunicaB come also as DYNAMIC Props for Hi-Definition Animations and Renderings. All the models are HI-DEF and so are perfect for every type of shot, also Details and Close-Ups. 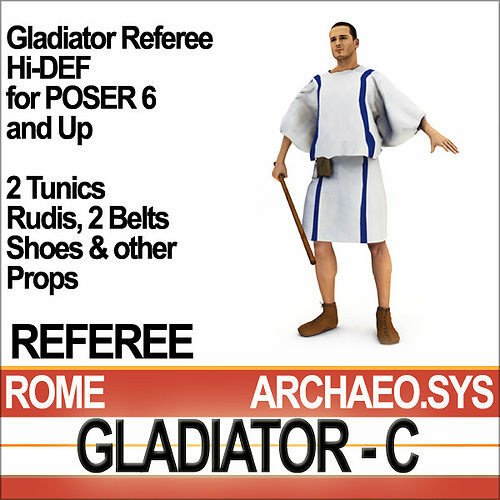 The Summa Rudis or Chief Referee and his assistant wore the same type of Tunica. The only way to make a distinction between the two was the staff, the rudis, which was carried by the Summa Rudis only. These models are useful for many types of sceneries, ancient sceneries but also modern ones, as for Roman re-enactment. * The Ancient Roman Purple colour was mainly a Red Colour as it is possible to see on the ancient frescoes with Cloth representations. But it is true that Ancient Roman Purple Colour was not a unique colour, since the preparation of this type of colour implied different levels of 'purple' saturation: see Pliny the Elder. The Archaeo.Sys 3D series is developing high-fidelity 3D reconstruction of Objects, Architecture and Scenes from Classical Greek and Roman Antiquity.